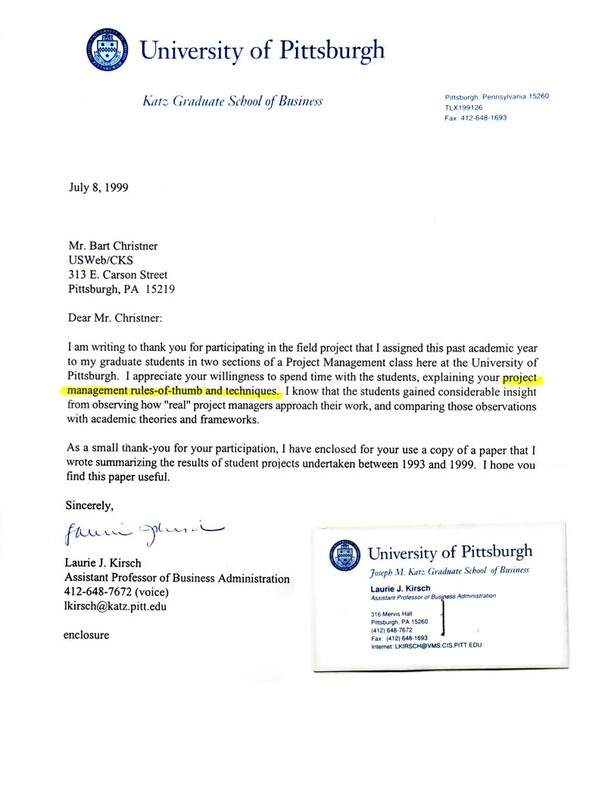 I am writing to thank you for participating in the field project that I assigned this past academic year to my graduate students in two sections of a Project Management class here at the University of Pittsburgh. I appreciate your willingness to spend time with the students explaining your project management rules-of-thumb and techniques. I know that the students gained considerable insight from observing how "real" project managers approach their work, and comparing those observations with academinc theories and frameworks. As a small thank you for your participation, I have enclosed for your use a copy of a paper that I wrote summarizing the results of student projects undertaken between 1993 and 1999. I hope you find this paper useful.